Editors' note: Here are guides and news stories for making theatre buildings, materials and practices more environmentally sustainable. Kellie Gutman's full report on how to green your theatre is here. Julie’s Bicycle launches the Theatre volume of their 3-volume report 'Moving Arts: Managing the carbon impacts of our touring' on 22 June at the National Theatre, to coincide with the launch of their Green Theatre Programme. The study investigates the carbon impacts of touring both in the UK and internationally by bands, orchestras and theatres, and is the result of 9 months' research with over 300 individuals and organisations. The report measures the impacts of touring and presents practical solutions to help cut emissions. Volume 1 was launched on 17 June at the Royal Albet Hall, and Volume 3, on Orchestras, will be launched on 3 July at the Royal Festival Hall. Mojisola Adebayo talks about the effects of touring from a writer's and performer's perspective on our DVD on climate change and theatre here. The research, which focuses on the core elements of touring, looked at 97 tour leg samples in 2009 across the UK and internationally. It estimates that approximately 13,400 toones of CO2e (carbon dioxide equivalent)emmissions were produced by touring theatre. Touring bands produced 85,000 tonnes of CO2e (carbon dioxide equivalent) emissions, and orchestras produced approximately 8,600 tonnes CO2e emissions. The majority of touring emissions are from overseas tours, with personnel travel and freight accounting for the majority share of those figures. The report recognises that there is concern about the environment within the industry, and whilst high profile names are speaking out, that concern is not yet being reflected in the practices of touring. A number of barriers have been identified including the perceived financial cost; the availability of low carbon equipment and vehicles; and audience and artist expectation for spectacular shows. Julie’s Bicycle have identified 11 priority recommendations aimed at those responsible for all aspects of a tour - artists, managers, suppliers, promoters and venues. These involve environmental planning to sit alongside artistic and financial contributions, and sharing the data on emissions produced from a tour, as well as a range of other actions which reduce environmental impacts. Missions Models Money have launched the website for their project Sustainable Abilities, a project to help drive forward transformative responses to climate change from individuals and organisations working in the arts. Sustainable Abilities is supported by the Paul Hamlyn Foundation. Mo`olelo, the San Diego performing arts company, have completed their Green Theatre Choices Toolkit, information to help the theatre industry make choices that will cause less long-term environmental damage. The pdf is downloadable here. The toolkit was sponsored by a MetLife/TCG 'A-ha! Think It, Do It' grant. The reserach was partnered with Brown & Wilmanns Environmental Consulting and adopted their 'Green Choices' methodology. In 2010/11 the arts sector in Wales came together at three major conferences in Cardiff, Swansea and Caernarfon for EMERGENCE: creative practice for a sustainable future, to share ideas, ask questions and get practical tools for a more sustainable practice. Emergence: the document!, is downloadable and features 20 talks in the field of sustainability and the arts. Emergence was a partnership between Volcano and Cynnal Cymru-Sustain Wales. Going green in theatre can be difficult when dealing with an existing property, but a few companies have been able to build new spaces, which strive to be very green. 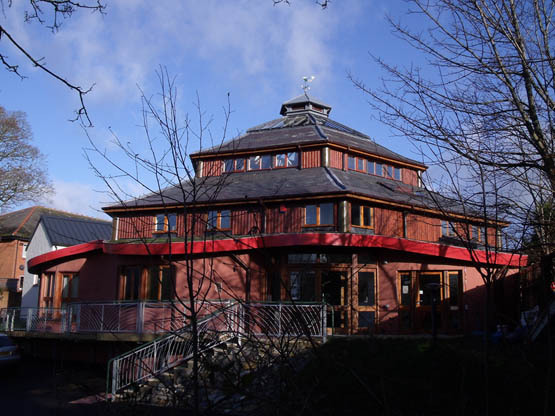 In Cardigan, Wales, the Small World Theatre has built the Small World Center, which tries to be as carbon neutral as possible. Some of the innovations they have included include a roof that is 30% green, planted with sedum, with the other 70% using recycled slate. The water from the roof is harvested and recycled and used in toilets, showers and for washing up. Six large Douglas Firs, from a locally managed woodlot were used to support the building and the oak beams came right from Cardigan. Bricks in the lobby were fired 100 years ago, from clay dug right on the site; sand for the concrete came from only a few miles away, and the lath for the lime/clay walls was local willow used as a wattle and daub wall. The building insulation comes from recycled paper. The new technologies called for imaginative solutions in order to fit with the rigid building regulations. Green Light Trust’s new headquarters and training centre in Bury St. Edmonds, The Foundry, is a ‘deep-green’ building, made of recycled timbers for the framing. The wood was given a lime wash before it was re-erected, to protect it from insects and fungus. Lime is also a fire retardant. The Small World Center opened on 17 June 2008. A majority of Small World Theatre’s many projects are environmentally focused, from their school touring show ‘Merlin’s Coat’, which has to do with global warming prophecies, to their new show 'Coedeuwydd', which was commissioned by the forestry commission and looks at trees as carbon sinks. Lime was also used for all the plaster and the floor, as it ‘breathes’, thus protecting other elements of the building. Hemp, grown locally, was used for insulation. All interior walls were made of wattle and daub from their own clay and hazel. Rainwater is recycled. As for heating, there is solar hot water and locally-produced biomass for heating. As much as possible, all material and labour were sourced within twenty miles of the site. 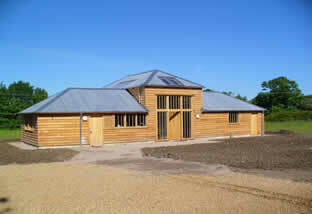 It won a prestigious RIBA Sustainability Award in 2006. 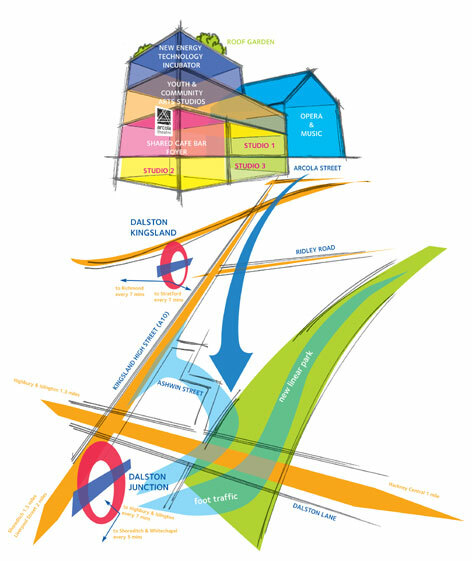 London’s Arcola Theatre is in the planning stages for a new complex, Future Arcola, which they hope to begin in 2010 and which will be phased in. The center of the venue will be an expanded theatre, plus there will be studios, a cafè and bar, and an incubator for new technology. The official launch of took place on 15 December 2009. More information will be posted as the project starts.